– The ones at work this weekday morning, bright an early. – The ones that sent off the kids to school and will be going to the grocery store after work to pick up dinner for the family. – The ones that seem to never have enough time for themselves. – The ones that like your job, or the income, but wish there were MORE TIME to do other things. – The ones that want to be home with your children when they come home from school. – The ones that wish there was just a little more money in the budget. If any of those resonate with you then listen up because this was me too! I have a career, and a degree, and thought that I was living the professional life I had designed. But, I still never felt like there was enough time for me. I was living a grind, and still didn't have financial freedom. I didn’t think it was possible or even an option, because I DIDN’T KNOW OTHERWISE. Well I’m hear to tell you it is!!! Want to find out how I went from that good life, to a better one–> supplementing income, traveling, improving my health, my family's health, being able to say "yes" when the kids want ski lessons, and music lessons, taking a quick weekend away with my husband. I know- like I once did, you are thinking what I’m going to offer is a gimmick. It must be a scam. That you have to be salesly. That you don’t have enough time. That you already have a job. Think about ME—-> have I EVER hounded you or pushed anyone to buy something or added you to a sales group to make a purchase? NOPE. Have I ever been that icky sales person to you? NOPE. Have I shown you that you CAN get PAID to stay healthy and happy? YEP!! Am I asking that you switch careers, nope. But if you want to be healthy and happy ANYWAY, why pass the opportunity to do so and maybe earn enough money to possibly take a vacation? You want to live healthy and happy ANYWAY, right?! I only want BUSY people. Why? Because I’ve seen that busy people are the most productive!! They know how to get things done! They are high producers! The most successful coaches on my team are all women just like us! I work full-time (40+ hours a week), have two kids, a husband, a house -- I'm an all around BUSY PERSON! I can show you how to grow this business in one hour a day! I can show you how to make the time! You don’t have to do silly home parties. You don’t have to carry any inventory. This fits in with your current lifestyle. The only investment you need is the DESIRE to have more freedom for your family and to want to live a healthy and positive life. My team is growing, and the simple training systems are AWESOME and have PROVEN success among new coaches. My Coach Training Academy starts on Monday, and will show you everything you need to know to be successful. So, as you are sitting in traffic after work, on the way to the grocery store, or at your desk, or stuffing down your food on your “working lunch” break, THINK about my words and the life you could have. What if, you could be the one with with freedom while others wonder what the heck you do for a living because you are enjoying life . This COULD BE the best decision you ever made that you didn’t know even existed because you thought you already “had it all”. I am looking for FIVE new women to join my team. Let’s do this this! 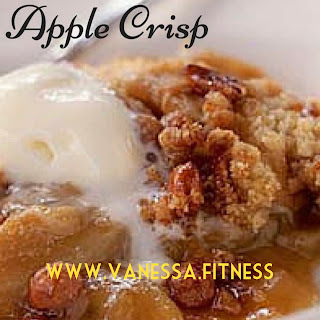 This apple crisp recipe has to be one of the best warm desserts there is! It's healthy, sweet, and indulgent, full of that comforting dessert goodness! My family wanted a dessert and I needed something quick and easy! This satisfied their sweet tooth, and mine, and didn't kill my calories for the day. 2. In a medium bowl, combine the apples, 1 TBSP maple syrup/honey and 1 tsp of cinnamon. 3. Pour into an 8x8 baking dish and set aside. 4. In a small mixing bowl, mix the nuts, oats, remaining syrup/honey and cinnamon. 6. Bake at 375 degrees for 20-30 minutes, until apples are tender. Serve with a small scoop of Greek yogurt (flavored with 1/2 tsp of vanilla extract and 1/2 tsp honey). A friend of mine tried to describe this recipe to me, without any measurements or details. 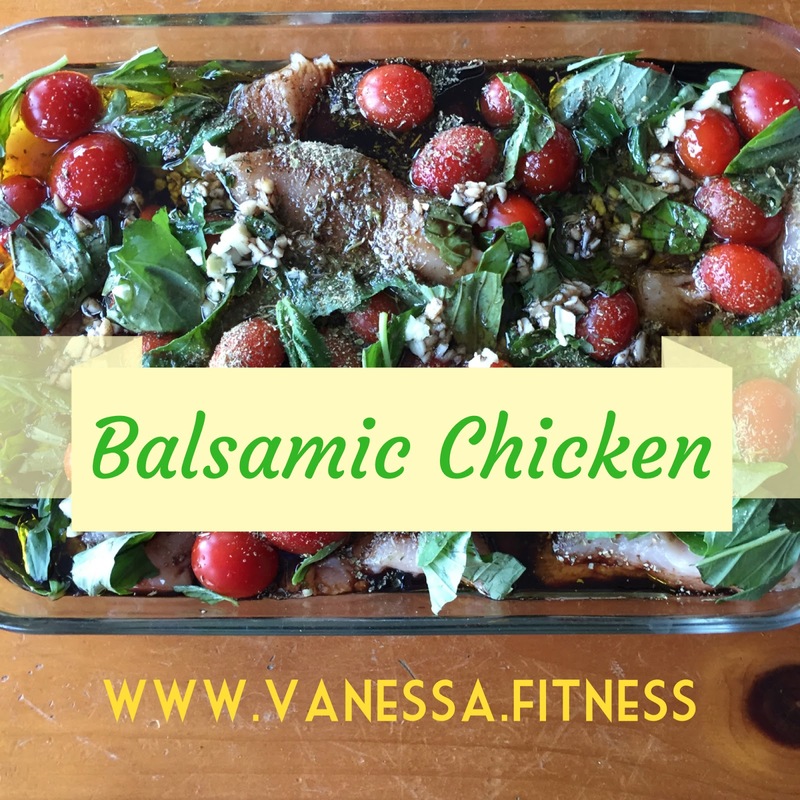 I decided to try to create it, and it was tangy, and flavorful! Easy to make, and enough for leftovers. 2. Rinse tomatoes pour into the bottom of a 13x9 inch glass pan. 3. Cut chicken into bite size pieces. 4. Sprinkle chicken with salt, pepper. Use as much or as little as you prefer. 5. Using a garlic press - crush garlic then distribute onto chicken pieces. 5. Mix together balsamic & olive oil then stir and pour over the dish. 6. Add in chopped basil. 7. Sprinkle Panko bread crumbs over the top. 9. Bake for 35 minutes covered then another 20 uncovered to brown. * I served this over quinoa. It tasted even better on the second day so be sure to enjoy the leftovers! If you love smoked salmon, this recipe will satisfy your taste buds! Ever since I had smoked salmon Eggs Benedict on vacation a few years ago, I've been wanting a healthy version of the recipe. This is it! However, when I make poached eggs at home, they never turn out they way they should, so instead of poaching, like this recipe below calls for, I just cooked mine over-easy in a non-stick pan. 1. Combine 3 tsp. lemon juice, garlic mustard, and yogurt in a small bowl; mix well. Set aside. 2. Bring water to a boil in medium saucepan over medium-high heat. Add remaining 1 tsp. lemon juice; reduce heat to maintain a gentle boil. 3. Place one egg into a small bowl. Hold bowl close to the water's surface and slip the egg into the water, repeat with remaining eggs; cook for about 3 to 4 minutes, or until egg whites are completely set. Gently lift eggs out of water with slotted spoon. 4. 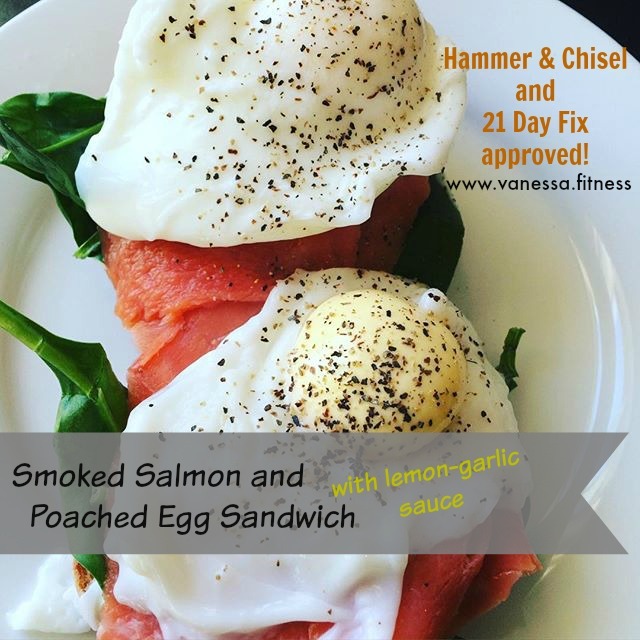 Spread English muffin halves evenly with lemon garlic sauce; top evenly with spinach, salmon, and egg. Maybe you know, but maybe some of you don't: I am not a full time Beachbody coach. I do this in addition to my full-time (8:30-5:30) job as well as my job as a wife and a mom. Why do I do it? Because I love it. 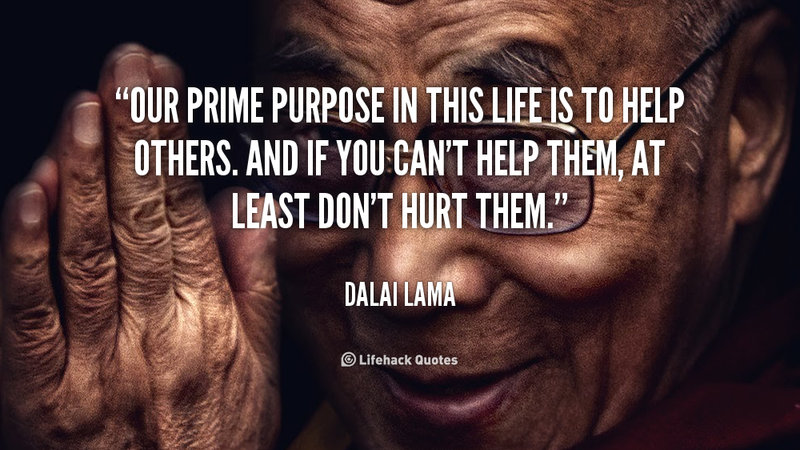 I love helping others; I love mentoring others; and I love surrounding myself with inspiring people. I love it for many reasons, but I also love it because of what this opportunity has done for my family. I didn't sign up to do this for the money, I just thought I'd do this as a hobby and pay it forward, but it turns out when you do pay it forward and you continue to give your talents to others, it comes back to you. In the month of December my part time "hobby" that I have as a coach brought in quite a bit of added income for my family. In fact, it's enough to take a family vacation in the near future! That's while juggling the chaos of the Christmas season juggling kids, their activities, school projects, and mom and wife duties. Not to shabby for some money on the side huh? It turns out my in communications and teaching, as well as my background in fitness complement my Beachbody business. My passion for teaching and health is the reason why my team is doing so well. The best part, I get to pay it forward and train others how to make this work and earn some extra income too. 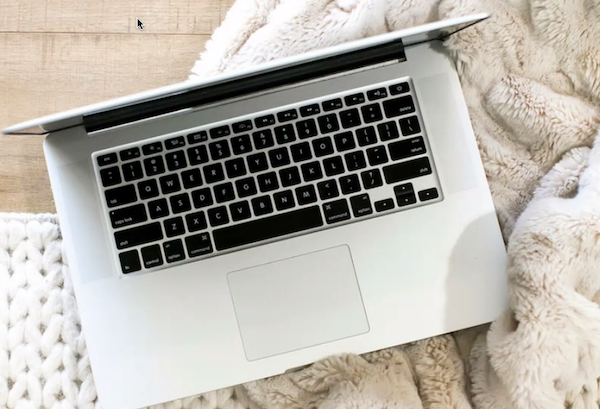 Each night as I sit typing away at my computer, instead of watching TV, I make an intentional decision that for these few short years I will work harder than most, so that for many years to come my family will live with financial freedom. Some night's I'm exhausted, and balancing it all seems overwhelming, but I know what is waiting for me and my family at the end of this. I am currently looking for five women who want to make a positive change in their life! You do NOT have to be a fitness professional, at your goal weight, or someone who has an experience as a coach. But, you do need to be someone who is willing to commit to putting in the work, who is genuine and loves to share with others what has worked for you, someone who cares for other people, and someone who wants to learn! You will be personally mentored by me and learn exactly what to do to see success. The tools will be placed in your hands! All you need to do is run with them. 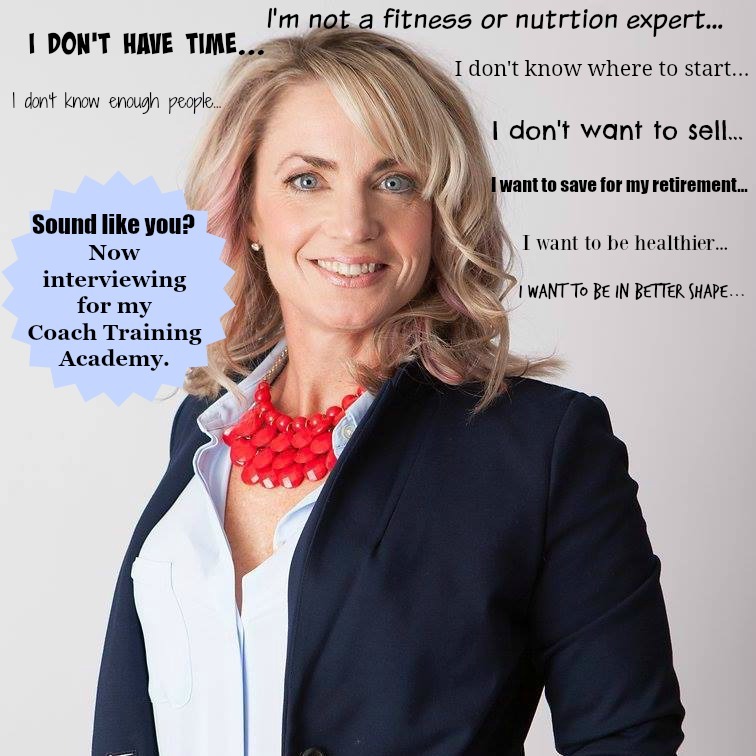 When I started as a health and fitness coach, I was hesitant of having the time to dedicate with a full time job and two young children, but I knew in my heart that an opportunity was calling me. I couldn't stop thinking about it so I took a leap of faith and I am beyond happy with my choice to become a coach! I was also shocked (in a good way) of the financial freedom has given our family especially because I love it! I am growing something that is all mine, the best part is you can do this if you are open minded, willing to learn and want to help others including yourself. I will be with you every step of the way! Friends, family, co-workers ask me about coaching, but then they don't commit because they don't have time, or they are afraid the will fail or that they don't have anyone to invite. I get it! Those are real reservations and I had them too! But what I know now that I didn't know then was that if you are PASSIONATE, DRIVEN, you are TEACHABLE and you are willing to GIVE IT ALL YOU HAVE GOT then I can TEACH YOU HOW TO BE SUCCESSFUL!! We all have the same 24 hours in a day. 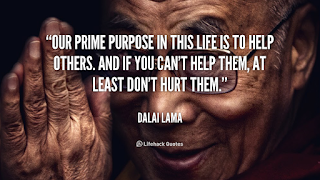 Do you want to spend yours tediously working away at the drudgery of the daily grind, or tirelessly, and joyfully working on your own business, making an impact, HELPING OTHERS? So now is the time! Are you a BUSY WOMAN? Then I want you on my team! The conditions will never be perfect! The only thing you have is today and tomorrow is not guaranteed! So why wait! you have nothing to lose! Check out the live Q and A informational session this Wednesday, January 20 at 8:30 pm! Click on the link or fill out the form below! 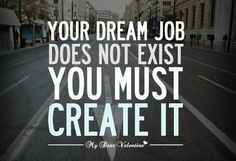 **** Just to make corporate happy**** - "Beachbody does not guarantee any level of success or income from the Team Beachbody Coach Opportunity. Each Coach's income depends on his or her own efforts, diligence, and skill. I am loving Gretchen Rubin’s new book Better than Before. I found the book title when looking for info about how to change habits. Gretchen’s work is grounded in research. She carefully, methodically provides a solid foundation for her ideas and follows up with personal examples that are easy to relate to. Even though they’re grounded in scientific evidence, they read very easily and our relatable to moms like me. 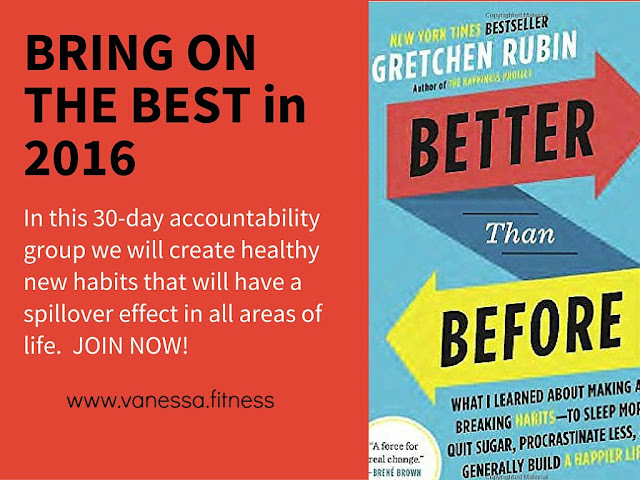 In Better than Before, she describes how habits are formed differently for different personality types. She is a creature of habit and a rule follower. I am a rule follower to others (work, traffic rules, deadlines), but not to myself. What is so interesting to me is how different people form habits in different ways. We can use this information to determine unique ways to motivate ourselves and keep us on track. With those tools, we can effectively improve quality of life in 2016. A workout program, which I help you choose so you can get the one that fits your lifestyle. Information on scheduling to create good habits. Insight into your habit-forming personality type. If you have participated in a group before, message me on Facebook or email me (vanessadotfitness@gmail.com) to be added. If you have not, please fill out this application so I can learn more about your individual, unique needs. 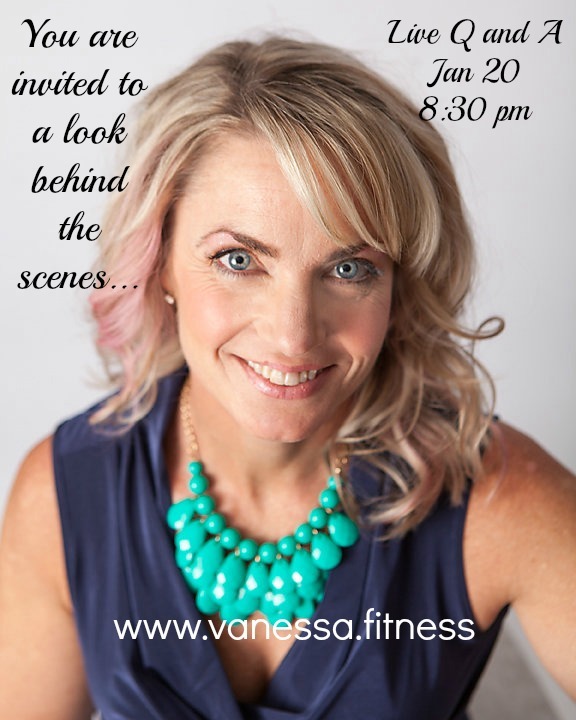 EMAIL me at vanessadotfitness@gmail.com and let me know if you’d like to join, or fill out the form below. I made this on the first single-digit temperature night of the winter. 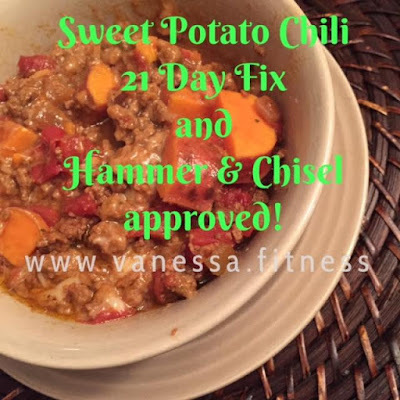 A comfortable, filling bowl of warm, this sweet potato chili is healthy, gluten free, paleo, dairy free, 21 Day Fix and Hammer & Chisel approved! 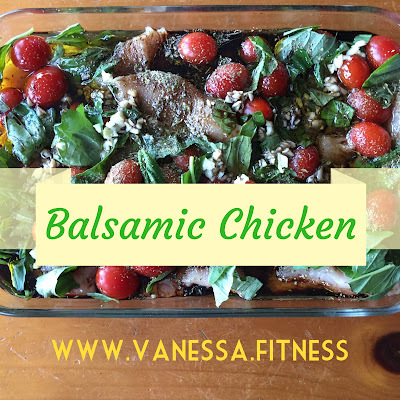 I found many recipes for this online, but as usual, I tweaked it and made it my own, for my families tastes. I left out the tabasco so the kids would eat it, and my husband and I, individually, put on the extra heat! It was a winner for the entire family, especially since the hubs and kids got to dip in tortilla chips! The sweetness of the potato blended with the spicy, savory chili, was perfect for the wintry night! I added a green container of chopped, wilted kale to my bowl, to increase the nutritional value and the veggies! 1. Heat 2 tsp. olive oil in a medium-sized soup pot heavy, add green pepper, onions, garlic. Cook for about 2-3 minutes until onions are translucent. 2. Add ground turkey, and cook over medium-high heat until the turkey is well-browned. 3. Add chili powder, cumin, tomatoes, tomato sauce, broth and cayenne pepper. 4. While the chili simmers, peel the sweet potatoes and dice into pieces about 3/4 - 1 inches square. Add sweet potatoes to the chili and simmer about an hour, adding a little water if it gets too thick. 5. Taste for seasoning and add Tabasco Sauce, salt, and fresh ground pepper to taste. Serve hot. This will keep in the fridge for about a week or can be frozen. Can add a little shredded cheddar or a dollop of plain Greek yogurt on top. The cheese would add a blue container to the container equivalents. Want more recipes compatible with the 21 Day Fix or Hammer & Chisel? 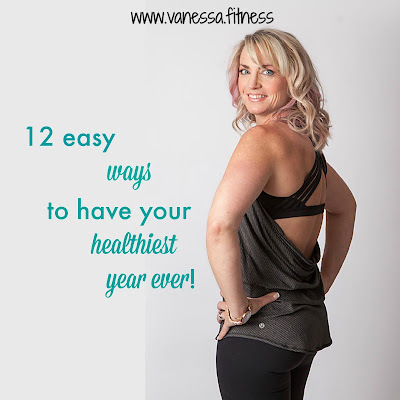 Need support with your fitness journey? Fill out the form below for more info! Easy ways to have your healthiest year ever! Every year we make resolutions with the best intentions, but only a small percentage of people keep them up for a full 365 days. If a resolution is too complicated or challenging, there's a good chance we won't stick to it for the entire year. But setting goals doesn't have to be so much work; simply committing to tiny tweaks can actually lead to big results. 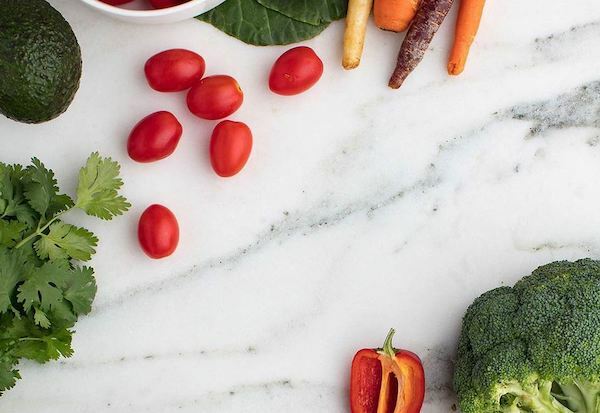 These resolutions are ones you can actually keep — little changes to your daily routine, implemented over time will leave you feeling your healthiest ever! Pack your lunch: Not only does bringing your own food to work save calories, but it also helps save money. Both your body and your budget will be better than ever, and you'll know what foods you're putting into your body. Maximize your morning: Whether you take time to hit the gym, stretch, or just relax with a cup of coffee, jump-start your day by making the most of your a.m.
Revamp your pantry: The key to cooking your way to weight loss is having a pantry stocked with the goods you need. Dump your old items for these healthy staples. Drink more water: Don't stress out over an exact number of glasses, but set a goal to just stay a little more hydrated. 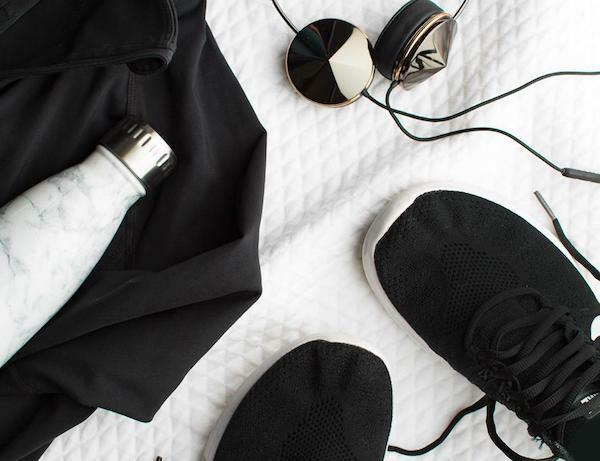 If you are craving a snack, grab water first, and start to keep a water bottle at your desk or in your bag for easy access. Try a new form of fitness: Even if you love your go-to workout of choice, trying something new will challenge you both mentally and physically. You may just find an exercise you can't quit when you give something new a try. Eat more vegetables: You don't need to try a fancy diet; just eat as many vegetables as you can every day. Get up and move: Don't let yourself get stuck sitting all day. Walk, dance, wave your arms around — do anything you can to move daily. Smile: It may feel unnatural at first, but forcing yourself to smile can actually improve your mood. If you find little things that put a grin on your face, every day will feel just a little bit better. Be nice to yourself: We all have days where we wish we could have been healthier, but don't beat yourself up just because you ditched the gym. Love yourself and your body, even when you're struggling more than usual. Stretch: No matter how much time you can devote to it, make it your mantra to stretch more. Improve your posture and keep your muscles healthy by giving them a little extra love. Rest up: Make sleep a priority. Try turning in 20 minutes earlier or turning off the screens an hour before you hit the hay. Go outside: Soak up a little extra sunlight and reenergize your body by stepping outside, even for a brisk walk around the block. Need some support and motivation? Join one of my free accountability groups. Fill out the form below to save your spot and get more info!